PBS’s Back Roads of Montana will air May 18th @ 7:00. Click Here. It has been awhile since I posted on my web page. I’ve been very busy with commission work and loving all the challenges this presents. The book of the Montana Cowboys has surpassed my wildest dreams. We have lost several of them and I mourn our loss. They are definitely a rare breed……….I have been working on the Christmas card. I haven’t sent one for the past 2 years. It was my goal, when I started them, to do 20 in the series. I’m pleased to say they are at the printers. I had to up date the mailing list. Go through all the cards of the past 2 years and check all the addresses to see if anyone had moved etc. That in itself was a huge accomplishment. On the bright side, both cards will go in the same envelope and that will save the cost of postage. (It was .32 when I started this.) Now all I have to do is sign and number 800 of them. It may be a while before they go out. I’ll mail them all at once. I did post on facebook that if anyone had moved to contact me with their new address. Several have done this. The post office will not forward mail like they used to, and every year I have had to put them in another envelope and remail some of them. interest in what is happening………I love you all! Just mailed the Christmas cards out yesterday! Yay!! 800 to sign, number, address envelopes, with return address’s and stamps. It does take time. Thank God this is the last of the series. I’m grateful God allowed me the time to do 20 in the series. Proverbs 27:1 says “Only a fool boasts of tomorrow.” YES I am grateful. Now if I can get all the commissions done. Will post more next month. Not that far away is it. There I go again, boasting of tomorrow! We are mobile! We live in a camper outside of Sheridan, Montana. New adventure for us and we are loving it. One should be able to do the things they love when you reach a ripe old age! My husband will say, speak for yourself! Seriously, when you paint it is great to pick up and go wherever you want. Our phone #’s will stay the same. I have several commissions to do and paintings are in progress. (406-579-5859) (208-790-4891) We plan to be in the area for the summer. The cowboy show will hang in Ennis the Month of Aug and there will be a show in Virginia City July 11, 2014 of all the local cowboys that are featured in the book. Also a few of the local people of Virginia City and area. I did a collection of Montana Cowboys. The collection was of 52 Notable Montana cowboys. The oldest was 94 years old. August was a fun month! So many exciting visitors. Got lots accomplished. Some of the “Red Hat Girls”blessed me with their presence. We had a wonderful time with them. I must post a poem Bev Lenz sent back to me after their visit. I have never been a Cowboy fan. Seems those I’ve met were more boy than man. All able to speak through their eyes. Softened them some, not so gruff. Things kept inside, words never heard. You showed in their faces…You should be proud! Thank you Bev…I only hope the poems I write for the cowboys will be as appreciated as yours was to me. 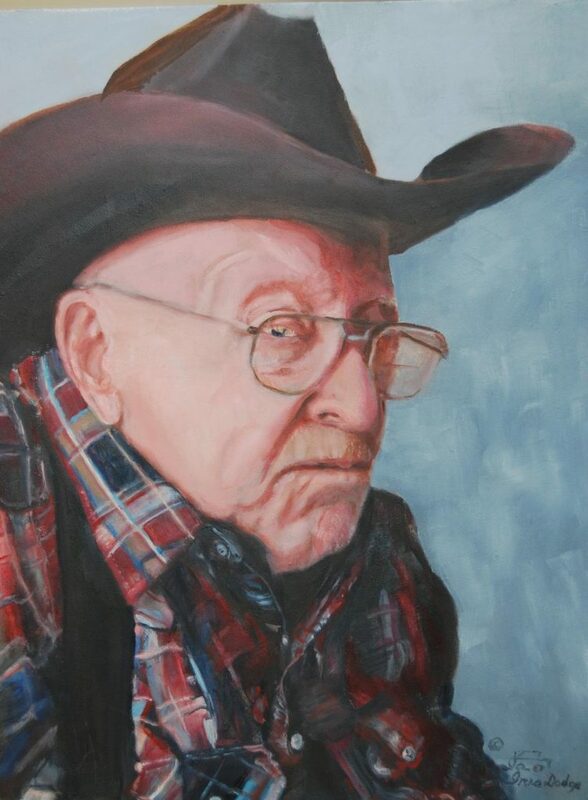 I’m working on the big 4′ by 6′ painting, along with other portraits of the cowboys. wouldn’t have been a book. Amazing work he does. Fast too. Over 250 people from all over the nation. Most had their card in their hand or were with family of one of the cowboys. The Heritage Center & Museum did an awesome job of hanging the show. There were people from MN,OR,ID,TX,GA,CA,AZ New Mexico, FLorida,WA, UT, NV, CO and of course all over MT. PBS of Backroads of Montana was there filming the show. commissions to do, orders to fill and still have company for a couple more days…the fun kind. Actually they all have been the fun kind. More later…God Bless. of them are sold. Hopefully I can get them to the Heritage Center soon. Thanks to all of you. Need to get the Christmas card painted. be a couple more years of them, making the total, 20 years of Christmas card limited editions. caption, you will see some of the covers that are available. I plan to add more cowboys on the covers. Also the cards and prints are available. I need to do much more work on the web page, facebook and other resources, but I have 12 commissions to get done and time is limiting. Thank you! Don’t hesitate to drop by if you are in the area. More next month. will be able to read some of the poetry for you and discuss how the show came about. I will be sharing the next part of the show with a very notworthycowboy poet. I will post more as time allows and more info comes in. In the mean time I am getting info together for the (now 13)commissions I have. Hopefully I will get to start in the studio soon. I do have to get the orders out from the book signing. Thanks. More soon..
hang in Ennis the month of August at Ennis’s new Hospital facility. Lovely place to exhibit the show. More next month. We will be in the area and I can be reached by my cell phone 406-579-5859. Also Ron’s cell phone is 208-790-4891.
accomodate the hospital hours. 8:00 until 5:00 Mon thru Fri. However, they are accommodating with those who ask for special times. So far the response is great. The books are for sale there also cards of the cowboys and other paintings. Not all the cowboys cards are there yet, but they have been ordered. Virginia City and Nevada City are in full swing yet. We are tucked into our little camper in Sheridan at the ranch of one of the cowboys that has a cancer issue. He runs 96 pair and is in the process of haying. He just underwent major surgery in Salt Lake. He was to be in the hospital a full week, then released to a motel room near the hospital and then on home. Well, we serve a mighty God. He had surgery on Tues AM and was released Friday PM to Motel. He was home by car Sat 6:00PM and on the 4 wheeler checking out if we had done a good enough job irrigating while he was gone. He has been in the field every day since. This was major surgery. Tumor off his one good Kidney and also cancer tissue from lymph glands. They got it all! !And the kidney never even bled. An awesome God indeed. In the mean time, I am working on commissions. Ron is ranching and all is well! More next month. Oh yes, Backroads of MT has been in contact and we will finish the segment soon. I’ll post the link on web page and also Facebook. Love you guys. 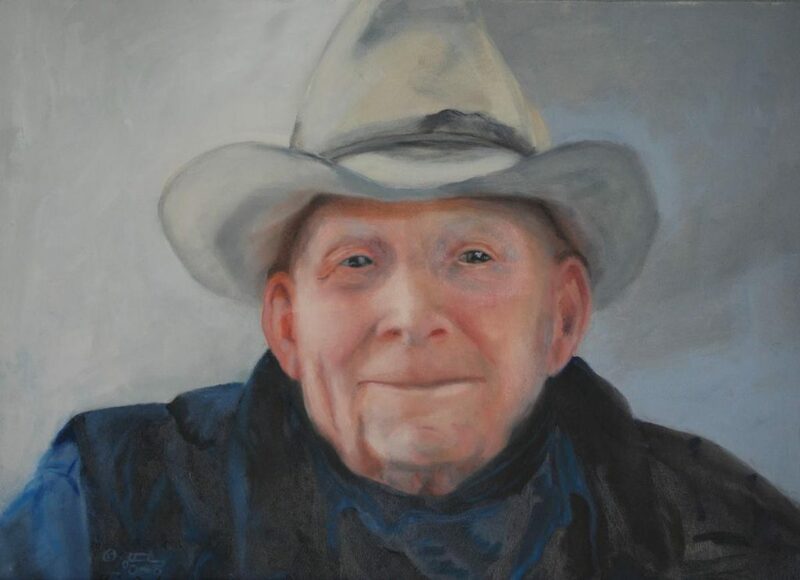 I posted my oldest cowboy’s portrait, Bob Shelhamer. He was 94 years young and rode his last ride on March 23, 2010. He will be missed by many and was definitely in a class by himself, as far as cowboys are concerned. He is the second one we have lost. I’m grateful I had the privilege to interview them and capture their likeness on canvas. I will post the first one we lost when I get back to the studio. We are Almost ready to wrap up the interviews.Thanks again for all your interest. Merle Skattum was my second oldest cowboy. He was 92 and from Paradise Valley. He too will be missed. Merle was loved by many. I’m pleased with his portrait and feel I captured his gentle spirit. What a remarkable man! I sincerely hope I don’t have to post another before the show.